Thanks to Las Cafeteras andUMS staff for making this evening a powerful and special event. 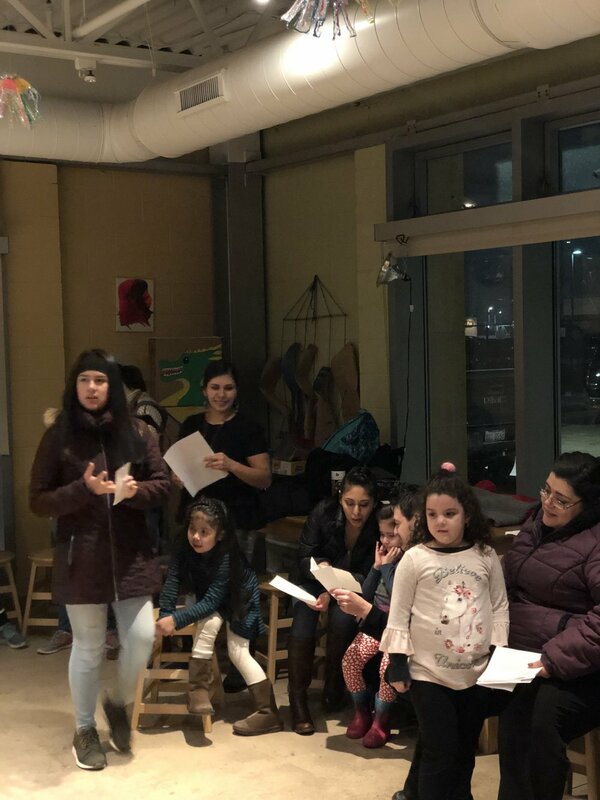 When I was approached by Emilio Rodriguez (former Living Arts teaching artist and current Community Programs Manager for UMS) about our hosting of a songwriting workshop for our youth, my instincts as a mom and daughter kicked in. Inspired by our Parent Advisory Council, I immediately felt the workshop needed to be centered around the bonds between our youth and their best advocates. As a proud daughter of Mexican immigrants, as well as a parent myself, I value the opportunity for parents to express their important visions for their families. As a first generation American growing up in Chicago, I was aware of my parents’ desire for a better life for themselves and their children. I have benefited greatly from the intentions set forth by my parents and all those who came before me. It feels incredibly important to be able to share bravely these intentions and dreams we have for each other within our families, however we come to define what family means. Knowing that sometimes it’s difficult to share these emotional dreams for one another, it seemed that songwriting could support us here as a doorway. With parents in one group and children in another,we all worked for the next 2 hours that evening, guided by the thoughtful and loving guidance from Las Cafeteras. In their normal art-making space, children busily got to work responding to prompts---I am from, I fear, My dream for you is--and so on. Parents did the same but in their own space in the atrium. The energy in the space where parents were writing was quiet, reflective, and-- most importantly-- without children present. As I walked quietly into their space, I observed parents as I had not been able to see them before: as purely creative, focused, and relaxed. Together, they created an ambience of what felt like a calm and powerful sea, waves of thoughts ebbing and flowing visibly. The determination of their words was very present. They worked quietly and profoundly, not bound physically to their children, as parents normally are. They were individuals manifesting and creating, together. Next, they gathered in a cypher, excitedly and nervously, sharing their writing with one another. They enjoyed each other's’ support, hugged by the musical accompaniment. Upon returning to the Art Studio, Las Cafateras invited everyone to share these newborn songs by playing a soft melody. 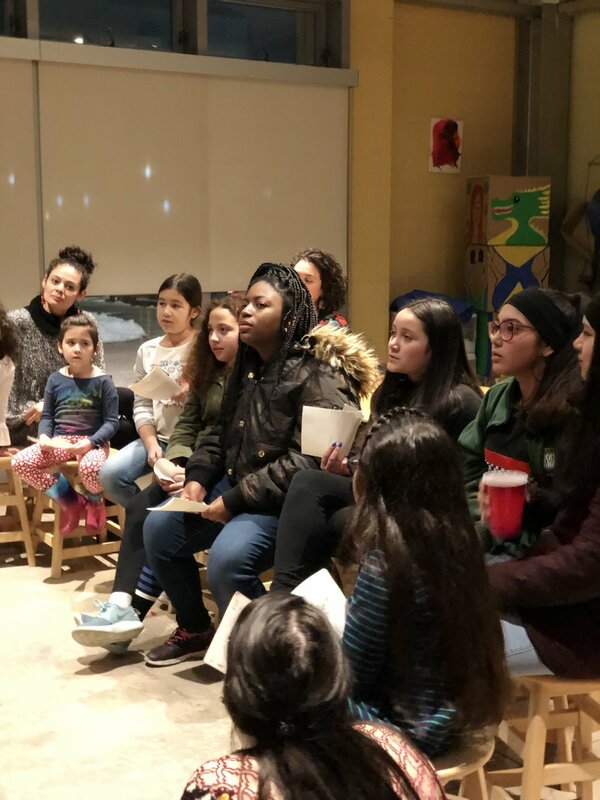 Guided in the cypher, parents and children shared with one another first as a whisper, gradually raising volume until a cacophony of poetry and music filled the room. These intimate exchanges communicated directly, bravely, and softly. The words are power. All seem eager to share the fruits of creative labor and love. All seem grateful to receive the precious words, once unspoken, now out in the world. The parents and children were then invited to share their words within the larger group, accompanied by the beautiful, live music, keeping the steady heartbeat of the entire experience. In this exchange parents and children manifested their origins, fears, beliefs, and their wishes for each other. Every person shared, emboldened by the energy of each other and sounds of encouragement from our new friends and their instruments. In this space, art is a portal -- connecting us as individuals to one another, as a community of individuals, and as a unit with all the potential of our togetherness. Here, art emboldened us to stand in relationship with each other, creating a pathway for connection and supporting the long-term journey of finding our power as people.